Seprod Limited (SEP), for the year ending December 31, 2017, reported Revenue of $16.51 billion compared to the $15.78 billion recorded for the prior financial year; this represents a 4.62% increase year over year. SEP noted, “the export segment delivered a 46% growth over prior year, despite some key markets being negatively impacted by the active hurricane season.” The company also stated, “continued inability to stem the losses in the sugar operations. There were signs of turnaround but these were all wiped out by challenging weather conditions. The inability to even reach breakeven in this operation is a huge source of frustration and clearly will require added intervention to avoid further erosion of shareholder value. Cost of Sales increased by 3.22% from $12.29 billion to $12.69 billion. Consequently, Gross Profits improved 9.55% to close at $3.82 billion (2016: $3.49 billion). Finance and Other Income for the year totalled $753.10 million relative to $1.05 billion in 2016 a 28.39% decline year over year. Selling expenses increased by 5.95% to close the year at $624.93 million (2016: $589.83 million). Administrative Expenses for the year increased by 8.36% to total $2.35 billion (2016: $2.17 billion). Other operating expenses climbed 39.54% to close at $268.61 million relative to $192.49 million. As such, Operating Profit contracted by 16.22%, to total $1.33 billion (2016: $1.59 billion). Finance Costs totalled $377.13 million; an decrease of 9.84% compared $374.63 million in 2016. Share of results of joint venture amounted to a loss of $54.24 million versus a loss of $28.16 million recorded in 2016. As such, Pre-tax Profits declined 20.82% to $938.96 million in comparison to profits of $1.19 billion last year. Net Profit for the year totalled $647.84 million (2016: $875.21 million), a 25.98% decline year over year following taxation of $291.12 million (2016: $310.72 million). 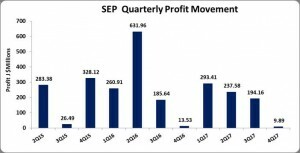 SEP noted, “our net profit for 2017, as expected, is below 2016 primarily due to the one-off investment portfolio gain of j$360 million that occurred in the prior year. the gain in the investment portfolio was subsequently realized and a special dividend paid to shareholders in 2016.” Net Profit attributable to shareholders totalled $735.04 million relative to $1.09 billion reported in 2016. Earnings Per Share for the year ended December 31, 2017 amounted to $1.42 relative to $2.11 for the corresponding period in 2016. The number of shares used in this calculation was 516,397,918 shares. The closing price as at February 27, 2018 is $33.34. As at December 31, 2017, the company’s total assets increased by 16.01% to $20.01 billion from $17.25 billion a year earlier. The major contributor was a 54.70% increase in Trade and Other Receivables which closed the year at $6.18 billion relative to $3.99 billion in 2016. Inventories also contributed to the movement with a 29.26% increased year over year to $2.50 billion (2016: $1.93 billion).